I mentioned recently that I had a bad break and had to go down to nubs again. Well since I was in mourning for my awesome coffin nails, I decided to wear black polish on my nubs. But not just any black polish, because that would be boring. 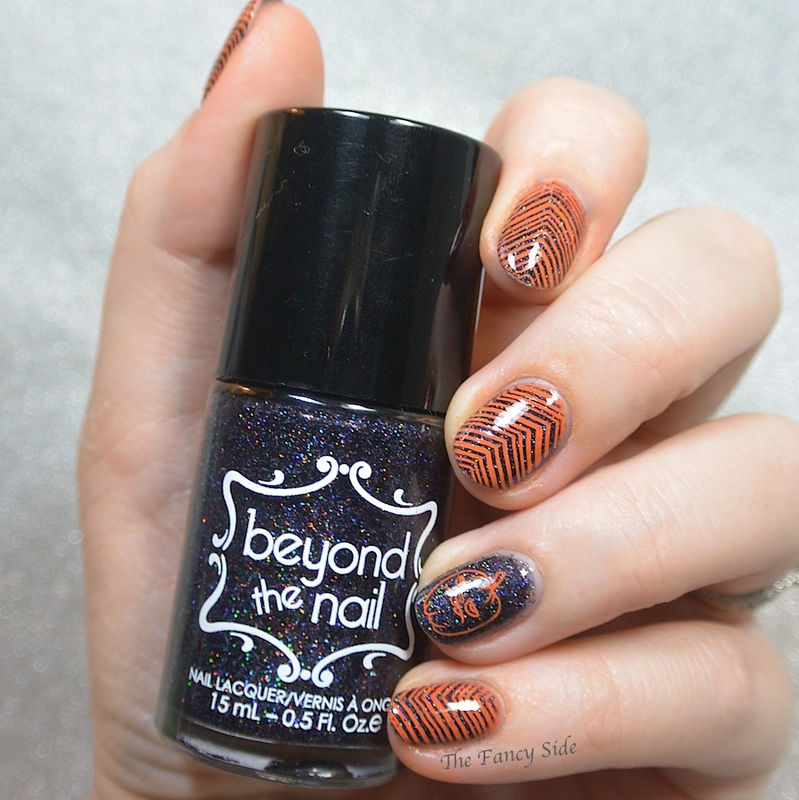 ;-) I decided on Beyond the Nail Holographic Black Microglitter* that is part of their Halloween line. Just because I'm sad about my nubs, doesn't mean I can't be fabulous. I used three thin coats for full coverage, and I did top it with a generous portion of top coat, because it dried a little gritty. I wore it on it's own for a few days, because it was hard to cover up the pretty, but finally I decided to add a little Halloween fun. I stamped on a lined pattern from Uber Chic 2-01 and a grumpy pumpkin (he's so adorable) from Uber Chic Halloween-01 in Mundo de Unas Geranium. I'm totally in love with the grumpy pumpkin. I love his "disappointed in you face". What do you think? The polish and the pumpkin are very nice! It's a gorgeous polish and you're stamping looks great! beautiful polish!! the stamping goes perfectly with it! I love what you did with this! Gorgeous! Thanks Tracey. It's always such a bummer to go from a fun shape to nubs. 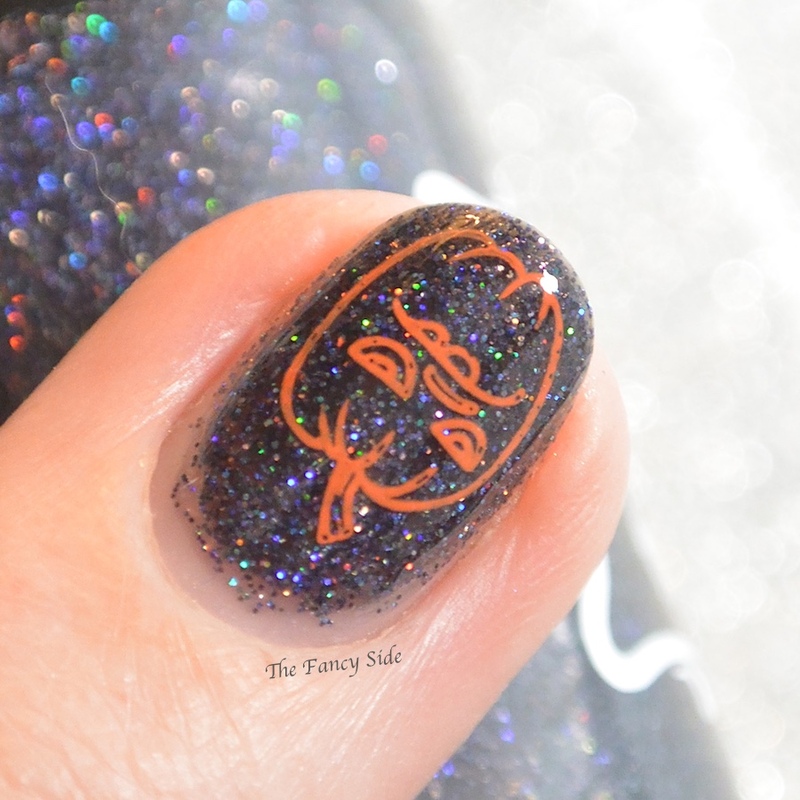 Beautiful mani, I love the grumpy pumpkin too! That pumpkin is fantastic! Love the addition of the stamps. 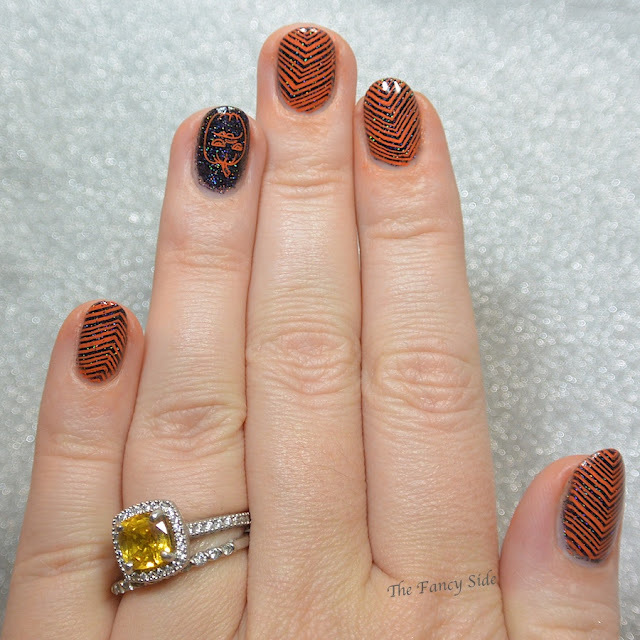 I really love the orange chevron pattern you layered it with! Thanks. Next time I might do it horizontal so you can see more of the pattern. 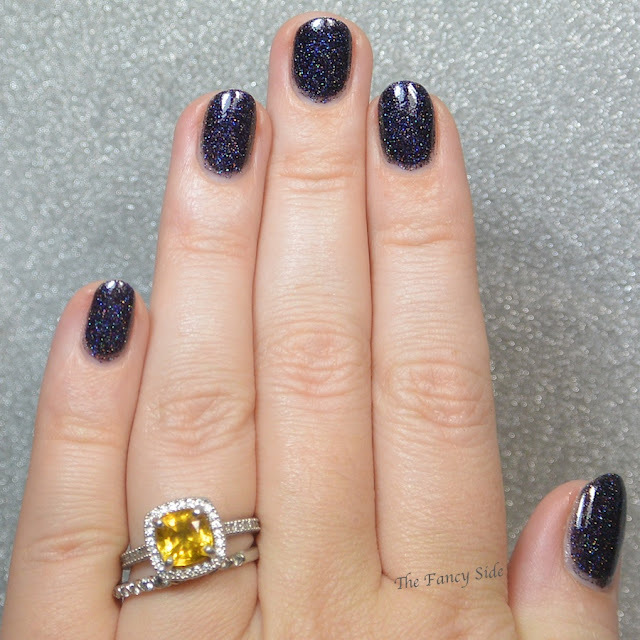 This polish looks great on your shirt nails and that little grumpy dude is just awesome! I love the grumpy pumpkin!